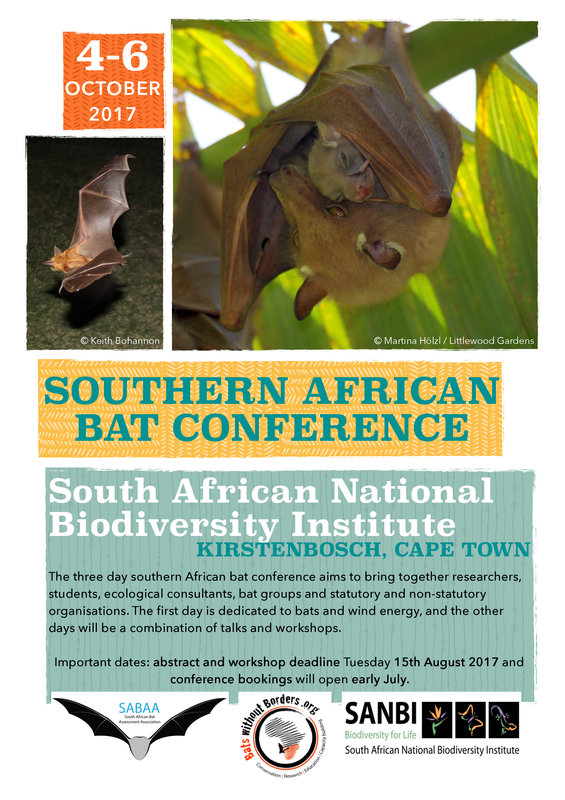 Thank you for your interest in attending the Southern African Bat Conference! The aim of the conference is to bring together researchers, students, bat group members, ecological consultants, industry and statutory and non-statutory organisations to share knowledge and learn more about bats across the region. Conference bookings will be opening shortly and anyone interested in welcome to attend. If you are a researcher or ecologist who would like to present your work please read the abstract guidelines. We are also looking for people to run workshops (2 hours maximum) to share knowledge and experience on the afternoons of 5th and 6th October and further details are listed below. Conference bookings are now open and will close on Sunday 24 September 2017. Earlybird discount applies until 31 August 2017. You can book to attend either one of the days or for all three days. Please note conference costs do not include accommodation. For some options of places to stay please see 'Places to stay'. We are delighted to offer sponsorship opportunities for organisations to support bat research and conservation in Southern Africa. Please note there are limited places for exhibitors but we do offer a range of different sponsorship opportunities, to find out more please contact info@batswithoutborders.org. A vital component for all biological conferences is the scientific advice provided by the committee. We are very grateful to the scientific committee members who are volunteering their time to give us support and advice for this conference. Lots of work is and has been going on behind the scenes and we'd like to thank the organising committee volunteers for supporting this conference. Workshop durations will be 1 to a maximum of 2 hours. We welcome a range of workshop options for the conference attendees to choose from, such as survey method, acoustic analysis, introduction to bats, designing and developing education materials, running bat walks, using citizen science to increase bat records. maximum number of delegates (for example for a call analysis workshop 8 delegates may be the maximum but for a talk on how to run a bat walk the maximum may be up to 30 delegates). Please note accommodation needs to be booked individually. Take a look at the range of accommodation options within close proximity to the SANBI conference centre.